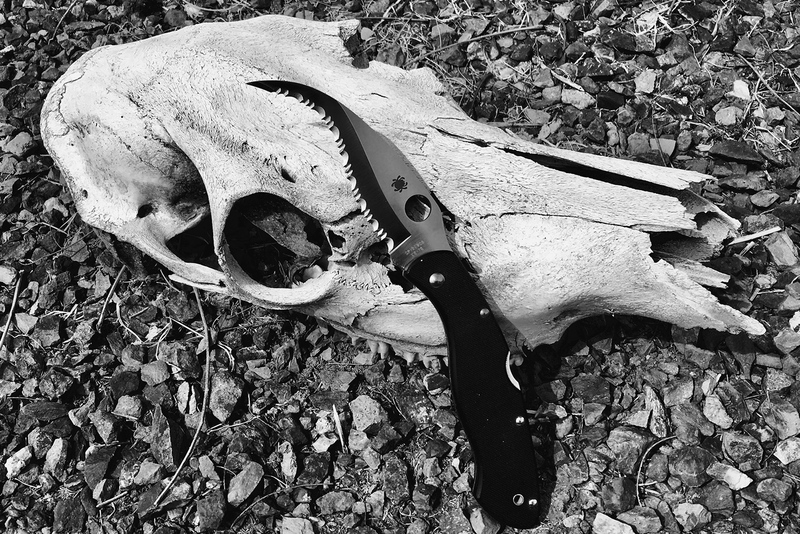 This is definitely one impressive knife to add to any collection. I don’t remember why (wait, do I need a reason? ), but about 15 years ago I decided to make this my first “big” knife purchase — a gift for my husband. I was only able to view it online and I ordered it through the owner of a local military supply store. I had never seen the knife in person, but I knew I had to have it. When it arrived a week later, I’m not sure who was more excited — the store owner or me. Before he let me leave, he gave me a very stern warning about the destructive capabilities of this knife. My husband, who grew up on a farm and very aware of knife safety, was thrilled with his new knife. The next day, when he opened the blade to show a few friends, he managed to slice open his finger down to the tendon. He didn’t get stitches but I’m quite certain he should have. It taught a painful lesson that you can never be too careful when handling knives. He still has a sizable scar as a reminder. After that one incident, the knife has never been used to cut anything again, so it hasn’t needed sharpening. 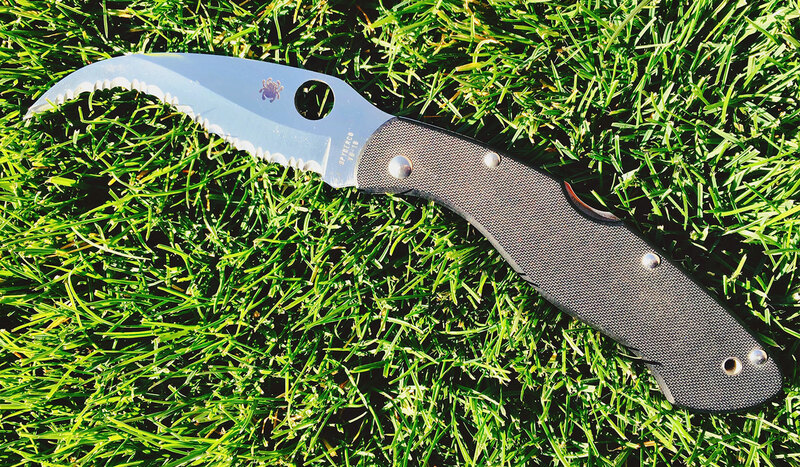 Should the SpyderEdge ever seems dull over time, contact Spyderco and they will sharpen it in the factory for a small return shipping fee. If you’re feeling confident and want to take on the challenge of sharpening the blade yourself, the 204MF Tri-Angle Sharpmaker is what you will want to use. 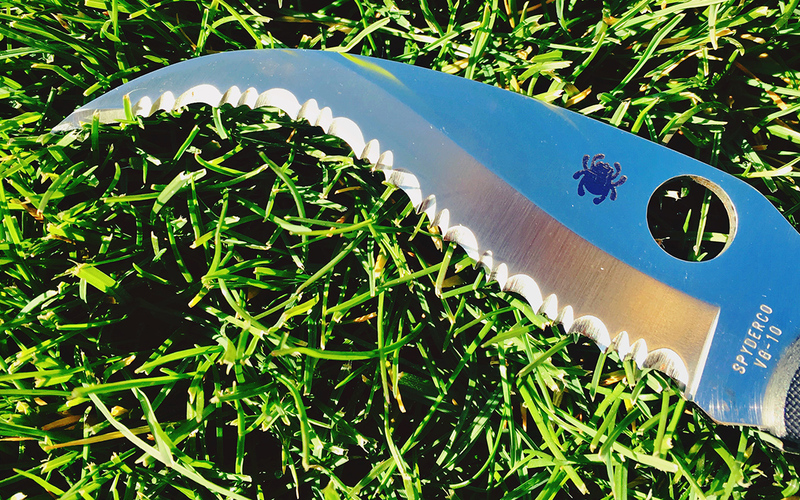 It is recommended by Spyderco to sharpen all of their blades, plain and serrated. There is a Spyderco-produced video posted on their site that explains how to use this unique sharpener. If the size of the Civilian is a bit overwhelming, then I would recommend the smaller and less expensive Matriarch 2. It has the same lightweight handle as the Endura 4 and measures in at 8.5 inches overall. 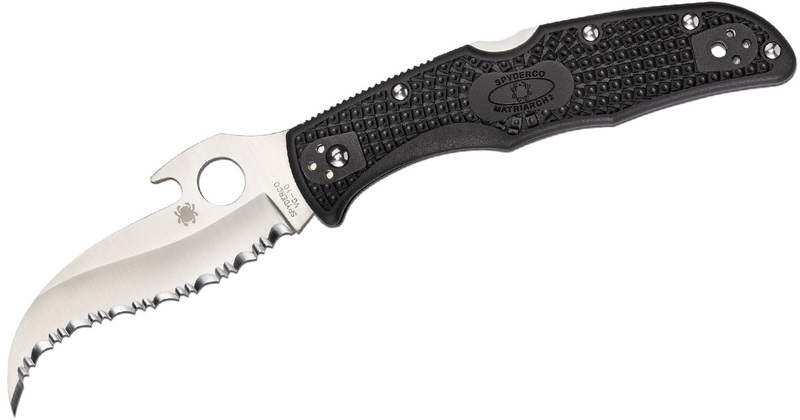 Spyderco markets the Matriarch 2 as a “personal protection tool” for women, but there is nothing feminine about this slightly less aggressive version of the Civilian. With the same VG-10 steel blade and secure back lock, you will feel just as confident having the Matriarch 2 by your side. If you’re in the market for a self defense knife, you can’t go wrong with either of these choices. To be on the safe side, you may want to get one of each. Jennifer Wood is a contributor to Knife Depot and writes knife reviews on her website PocketknifeHousewife.com. You can follow her on Instagram @pocketknifehousewife or Twitter @PktHousewife. I have several knives of varies kinds, I don’t believe a ban would get very far in America. While I myself do not care for that type of knife, I have booth hunting knives and pocket knives. As an avid hunter and fisherman, I have knives for the specific chores as I need them for as I’m sure most honest people do! Jennifer! You are amazing. I wish my wife saw my collection as an amazing collection of finely crafted tools instead of proof there is something wrong with me. How cool would it be to both collect and treasure fine knives. very good post very INFORMATIVE keep up the good work.